Samsung Flat-panel TVs with 30 channels of HD programming. Easy-access Plug-and-Play feature makes it simple to connect electronics. 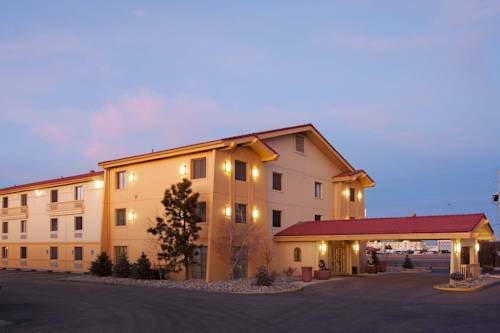 The La Quinta Inn Cheyenne is conveniently located just a mile from central downtown, close to the Wyoming State Capitol and state offices, and Cheyenne Frontier Days Fairgrounds, the world's largest outdoor rodeo. We are near the Wyoming Air National Guard Base, and just two miles from F.E. Warren Air Force Base. Visit Terry Bison Ranch, and the State Museum and Art Gallery. Stay here for events at the Civic Center and the Taco John's Event Center (Miniature golf, Laser tag, Parties). For excellent service and clean spacious rooms, the La Quinta Inn Cheyenne is the place to stay. All rooms come with useful amenities include free high-speed Internet access, a coffee maker, hair dryer, and much more. A Free Bright Side BreakfastTM is available every morning. Find us two miles west of downtown at the I-80 and I-25 interchange (ample Truck Parking). All reservations must be canceled before 6pm local hotel time on the scheduled date of arrival to avoid being charged one night's room rate plus all taxes. Cancellation date for Cheyenne Frontier Days is July 1st. Annie was a pooch who for 14 years greeted all who arrived at the Fort Collins train station. Retired college professor Samuel H. "Doc" Knight spent over 4,000 hours hand-hammering copper plates onto this 45-foot-long T. Rex. He unveiled it April 11, 1964.